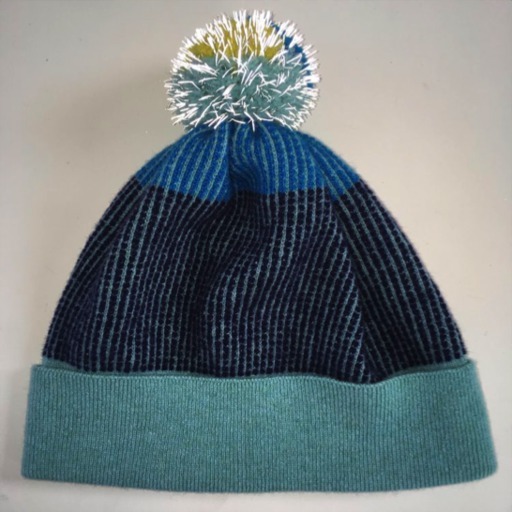 First up on our tour of Scottish knit and woven textile design is Green Thomas led by Emma Green and Alan Thomas Dibble – one of Scotland’s most interesting and considered knitwear design studios. This Glasgow duo met at Central St Martins in the early 90s and then went their separate ways around the world – unknowingly, both were stockpiling experience, inspiration and expertise in order to meet up again and form this astonishingly perfect knitwear brand. Green Thomas design and manufacture some of the most desirable and exciting accessories in the UK and are stocked in Whistles, the Conran Shop, and no less than five separate boutiques in Japan. 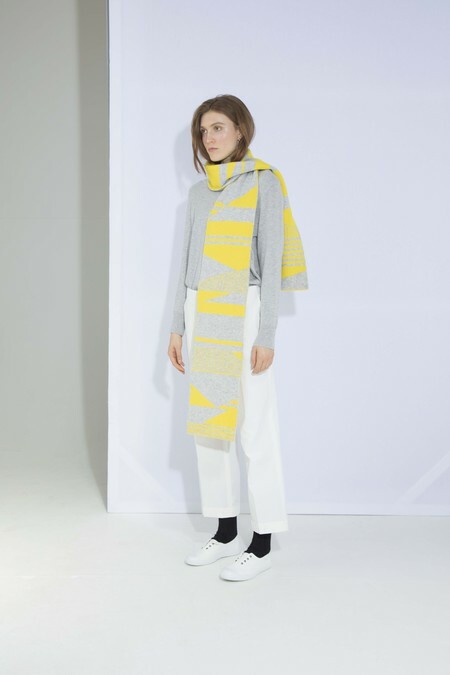 AW17 is their most assured collection to date with their signature primary colours and enlarged geometric patterns applied to blanket scarves, throws and probably the nicest pom-pom hat ever made (which sold out almost instantly – and makes us want it even more). In Alice Dansey-Wright’s joyful collaboration with knitwear designer Giannina Capitani, above, the illustrator’s simple line drawings, inspired by abstract representations of the female body, are translated by Capitani into 100% lambswool pieces in soft grey tones, reminiscent of graphite crayons and pencils. With roots in Scotland, Italy and England the designers met while studying Fine Art at the Glasgow School of Art and since then both women have developed their artistic practices into design-led businesses. Catherine MacGruer’s studio, based in the Highlands of Scotland, creates a range of interior and fashion accessories characterised by geometric shapes and meticulously considered compositions and colour palettes (pictured above). She describes her work as being “informed by the craft, history of design and new technologies of my industry.” MacGruer’s new Line & Block collection is inspired by the terrazzo and tile details found in Berlin’s U-bahn stations, the nuanced concrete and bronze curves of its architecture and the Bauhaus Archive itself. Argyll’s Heather Shields designs with both traditional and electronic looms. 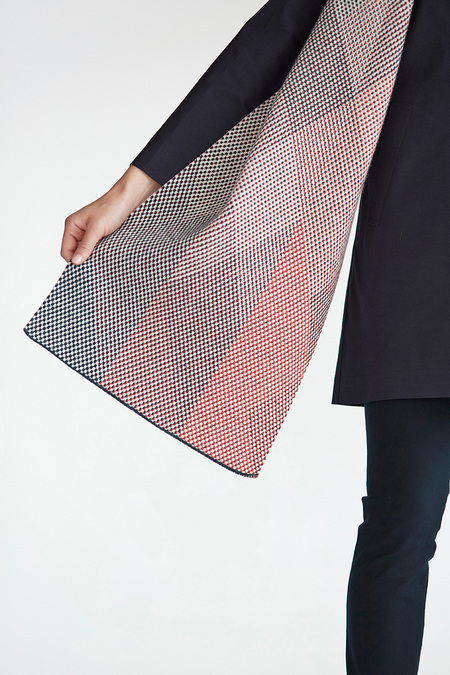 Her striking patterns, as in the Jazz scarf pictured above, and playful approach translate her fascination with the physical practice and endless possibilities for experimentation of weaving, through fibre, structure and colour. 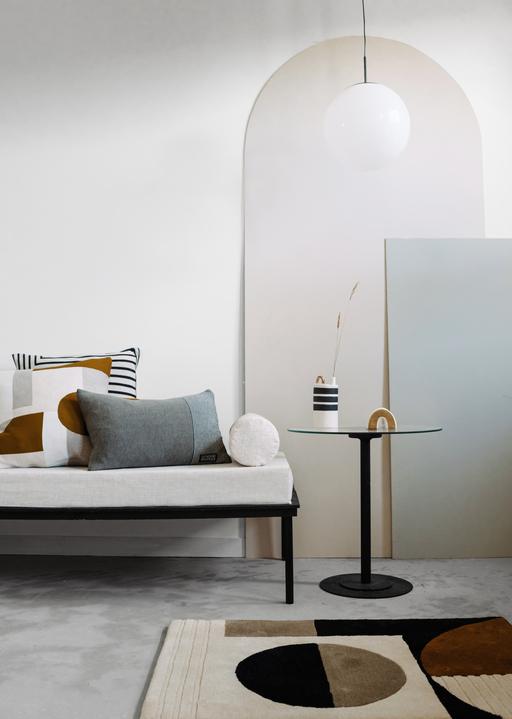 Her Puzzle cushions and Paperchain blankets are incredibly fresh, reinventing what seem like traditional motifs but on closer inspection are completely new and contemporary patterns with tightly defined edges and visual impact. Just one, perfectly placed, would lift an entire room – an interior designer’s dream. Jennifer Kent’s new studio shop opens this month on Glasgow’s Dowanhill Street. The studio is particularly interested in the interface between traditional methods and modern textile design, and specialises in creating modern knitwear collections that thoughtfully reflect Kent’s minimal aesthetic and impeccable attention to detail, as seen in her hats above. Her timeless knitwear designs for men are stocked in boutiques from Osaka to Zurich and a collection of her work was recently exhibited by The Lighthouse. Her reworking of the Sanquhar pattern – a traditional geometric style from Upper Nithsdale – helps this knitting practice gain international recognition and find new expressions. The newest contributors to Scotland’s knitted and woven textiles scene are similarly exciting and exhibit many of the hallmarks of radical design in action. 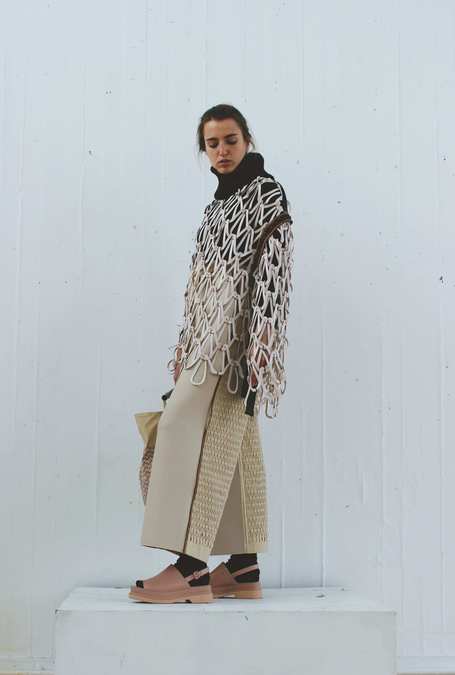 Both recent graduates of Edinburgh College of Art, Maddie Williams (work pictured above) and Ruth Williams are also 2017 Graduate Fashion Week winners. Visionary Knitwear Award recipient Ruth’s laser-cut knitwear was christened 'knit couture' by Vogue while Maddie’s collection made using recycled materials and naturally dyed English wools earned her the Catwalk Textiles Award. Atelier E.B (Edinburgh Bruxelles) is the company name under which the designer Beca Lipscombe and the artist Lucy McKenzie sign their collaborative projects. Lipscombe and McKenzie place art and design on an equal footing, “embedding critique into clothing and utilising the notion of ‘styling’ as an artistic strategy.” Their collection The Inventors of Tradition II was created in collaboration with Glasgow curators Panel and exhibited at The Palace of Art; the show featured the Liz jumper and Phillipa bottoms produced with Hawico Scotland. 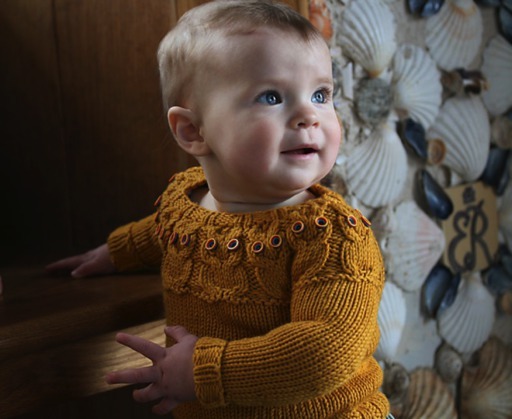 Living on Scotland’s West Highland Way is Kate Davies Designs (KDD, above) a studio creating downloadable digital patterns for hand knitters like ‘Owlet’, pictured. Founder Kate Davies developed her own brand of Scottish wool yarn for hand knitting and in 2017 launched her own knitwear line, KDD Originals. Davies is currently completing a memoir which explores her experiences of disability, creativity, and practices of making. Handywoman will be published in the spring of 2018. ERIBÉ is a knitwear design house and manufacturer based in the Scottish Borders founded by Rosemary Eribé James – now one of the largest hand-knitting companies in Europe. 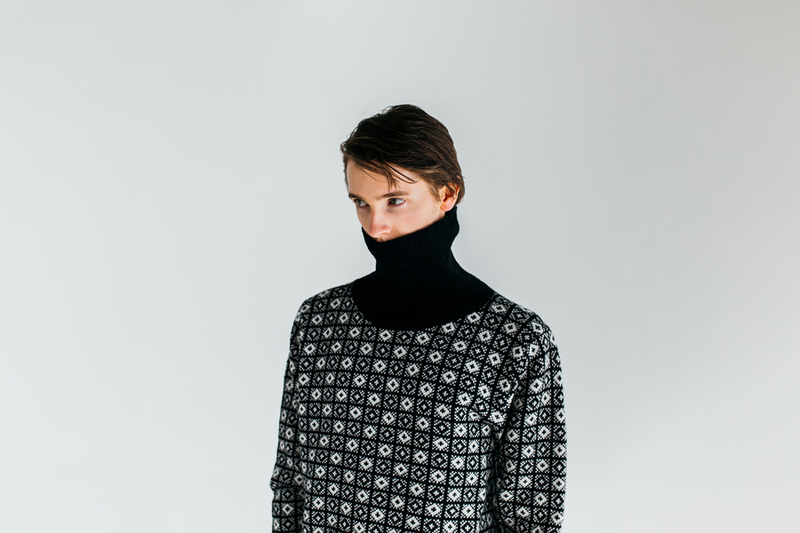 They first came to our attention from a collaboration with Eley Kishimoto – a joint-label capsule hand-knit range for AW15. With a shared love of pattern and colour, the collaboration resulted in hand-knitted garments “worthy of heirloom status” with each piece as bespoke and thoughtfully made as Kishimoto’s hand-printed wallpaper. Mixter Maxter is Orkney designer Kirsteen Stewart’s brand – the name is the Scottish phrase for ‘a bit of a jumble’. 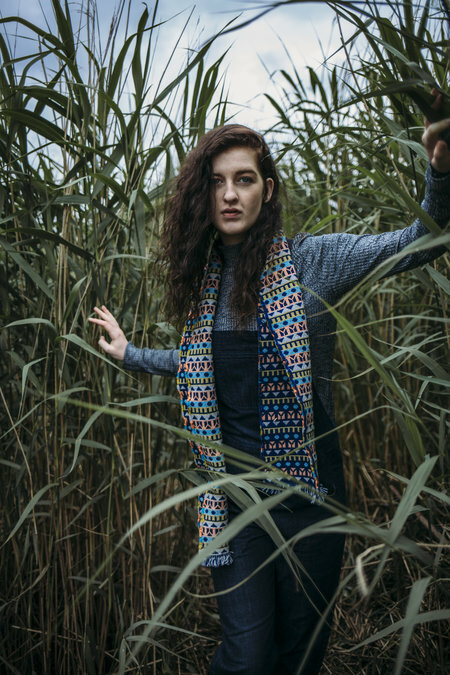 The playful collections of clothing and accessories are all designed and made exclusively in Scotland including the Vik twist (pictured) which is a lambswool neck scarf inspired by Viking runes. 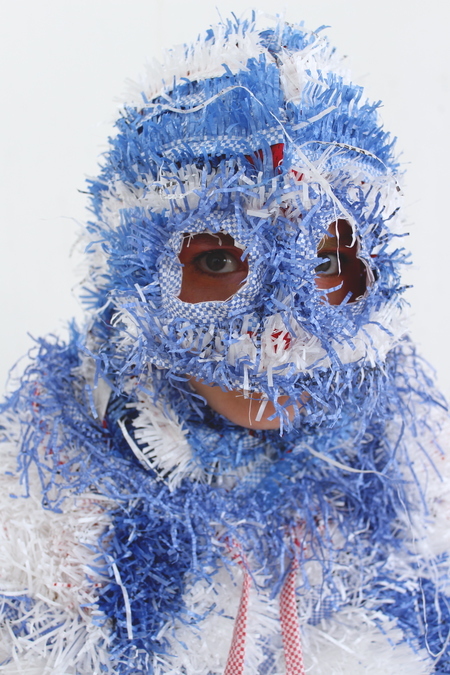 Angharad McLaren is an extraordinarily innovative designer (pictured above) and weaver whose work is closely connected with people. With live projects like Weave Parkhead and her Weavathons, McLaren passionately employs technology, craft, humour and sport – as seen in Scotland Can Make It! a project by Panel where McLaren produced limited edition Home & Away scarves collaboratively with Emlyn Firth. 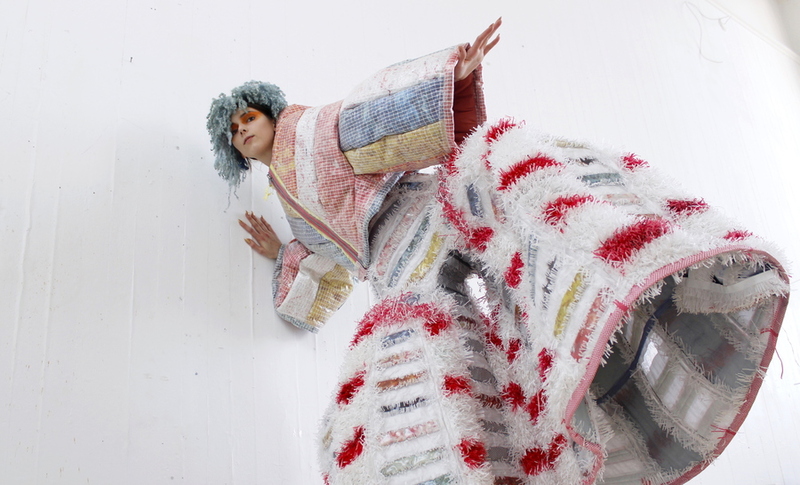 Her ongoing collections of hand, dobby and jacquard woven textile designs use a range of yarns, weave structures and finishes, inspired by performance sportswear, windsurfing and natural sea life. Experimental designs explore hand craft techniques, digital industrial production, high tech yarns and recycled materials to create three dimensional pleats, striking visual patterns and unusual tactile effects. Glasgow brand Mini McGhee nurtures contemporary and vintage influences to create modern Scottish knitwear for baby, child and nursery. Led by designer Nicola McGhee on her return to Glasgow after a successful career in New York, the brand’s baby blankets and handmade crochet toys are both contemporary and comforting. Future classics. Collingwood Norris are a luxury Scottish knitwear studio in the Scottish Borders producing jumpers and accessories for men and women. 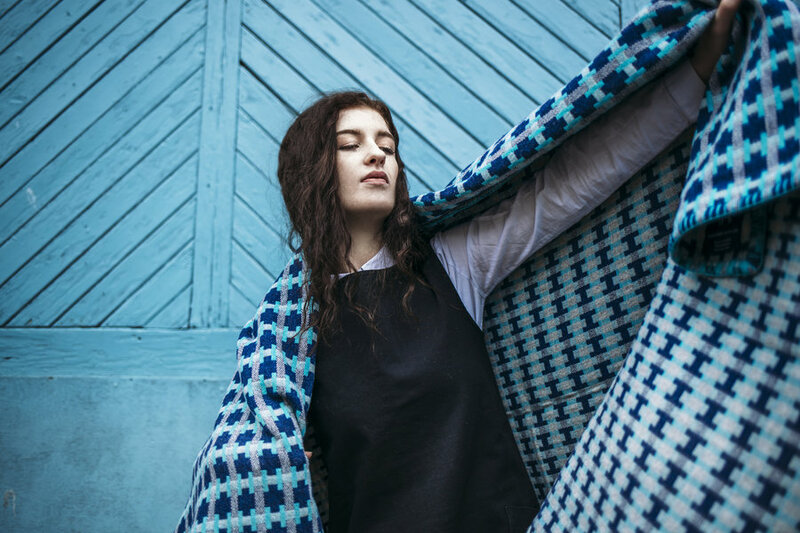 Using the finest lambswool, each scarf, blanket scarf, hat, and jumper is individually knitted by Flora in studio using hand powered knitting machines and traditional skills such as hand knitting and crochet. 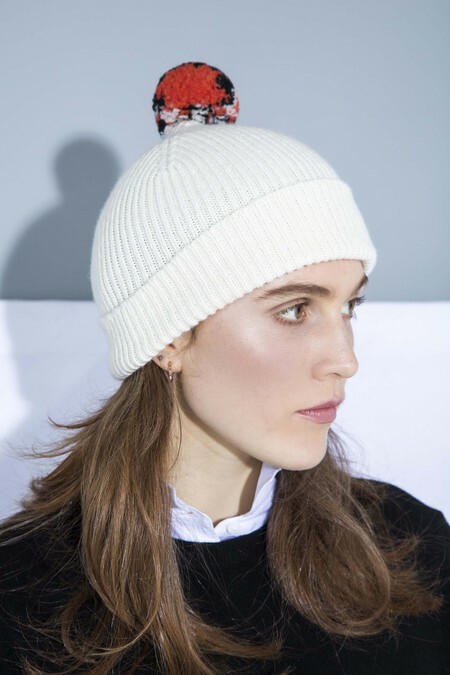 Their Reflector Pom Hats (pictured) are clever, useful and beautiful. The holy trinity. Former cartographer Olive Pearson took the expertise she had in designing one-off maps for the publishing industry, where she “loved the process of balancing colour, line, symbol and text detail” and applied it to textile design. The designer-maker, based in Glasgow, currently specialises in contemporary knitted accessories for fashion and interiors. The brand’s focus is on slow-fashion, and ethical and sustainable products with zero-waste. Each of Pearson’s designs is named after the building, street, or area that provided the initial inspiration and new designs and colour combinations are launched every autumn. 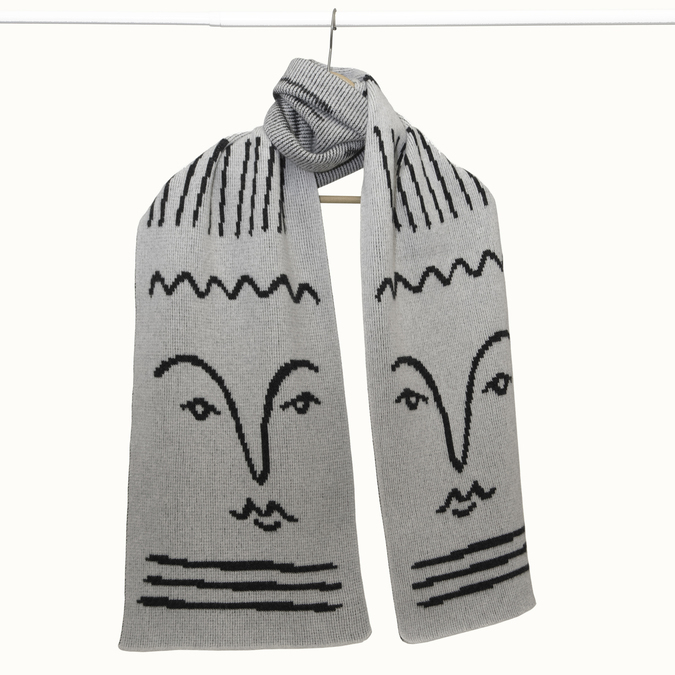 Seen here is the Dundee Stripe scarf named after the new V&A Design Museum Dundee by Kengo Kuma. 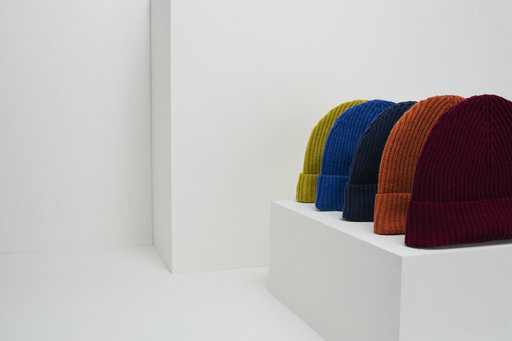 Rosie Sugden is best known for her cashmere turbans, beanies and bedsocks. The designer’s work is stocked in Belgium, Sweden, Switzerland, and Tokyo. Sugden’s passion for the manufacturing process and materials underpinning her brand is vividly illustrated by her recent blog posts about the factory that produces her products. Beautiful photography by Ciara Menzies shows modern Shima Seiki machines, threads and carriages moving. “I just love the process of things being made and I think a factory is a really exciting place,” says Sugden, whose most recent stockist is Anthropologie USA. Amy Bond is an award winning designer and weaver who creates contemporary handmade pieces for the home alongside fashion accessories. Based in Glasgow, Bond pushes the boundaries of weaving – exploring 3D forms and unusual yarns while extending the practice of traditional weaving techniques. 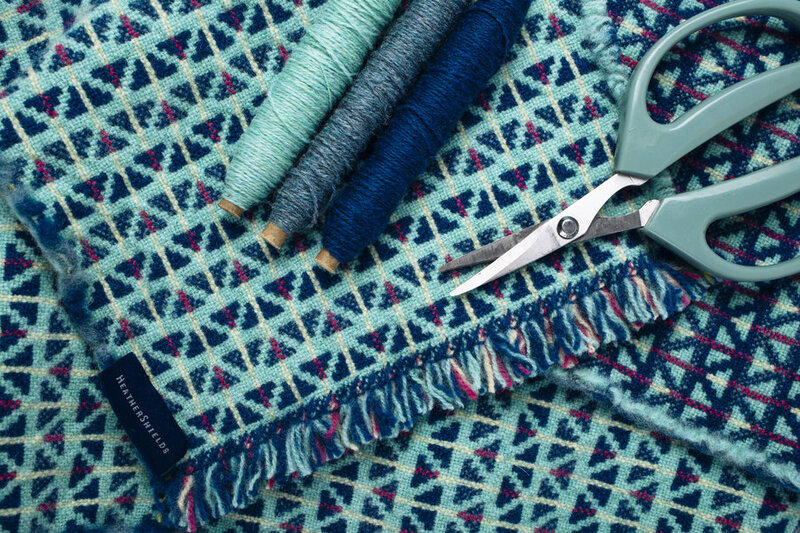 The designer is emblematic of a new generation of modern Scottish weavers catalysing the sector through experimentation in technique and design. Arra Textiles are based in a studio gallery on Royal Deeside and take their name from founder Lucy MacDonald's great grandmother. Every piece is designed and handwoven by MacDonald, from initial design sketches through to hand finished fabric. Arra’s woven throws are designed to drape beautifully and take inspiration from the seascapes and forests of the Scottish Highlands. Arra are an exciting, zero waste (less than 1% of yarn goes to waste), micro manufacturing brand with a slow fashion ethos that produces luxury sustainable textiles. Thanks very much to Edinburgh weaver James Donald of Pick One for his weaving-based contributions to the online article – for anyone inspired to get hands-on with weaving Donald holds regular workshops in Edinburgh – you'll find course details here. Scotland is so good at woven textiles yet it is almost as though we pretend not to notice, largely leaving the appreciation of it to Parisian fashion houses and tourists. To capitalise on the new movement in Scottish design Local Heroes would love to see Scotland develop a national policy for design – get in touch if you have support to offer on this mission or simply wish to help find more opportunities to celebrate and promote design in Scotland and internationally.